I would have to say this is the design that I’ve ‘redone’ more than any –ever. 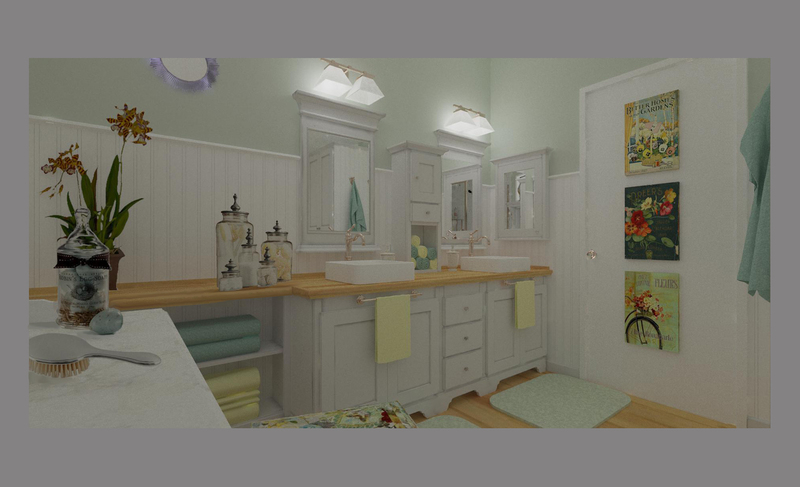 This is the sixth (and final) rendition of my master bath design renderings. I think I just needed to convince myself it was the best solution for the space, our needs and our budget. In the end we incorporated products and aspects of the project that we could mostly install ourselves (my husband, youngest son and I). Leaving only the plumbing and electrical to the pros. I should also add that I’ve done way more kitchens than bath remodels and found this to be much more intense in terms of design and technical know how. Much was driven by budget and making choices to get the most bang for the buck in the right places –like finding a prefab glass shower enclosure that was big enough. I think the Fleurco semi-frameless enclosure was the largest I could get for the space and is of excellent quality. We found the marble topped (and very heavy!) dressing table on Craigslist. This inspired doing the shower walls in a coordinating marble subway tile. The other splurge was choosing the nickel finishes on the hardware throughout. This choice was made based on the shower head which was a gift from my friends at Brizo that I received when I visited their headquarters last July for the Blogger 19 Reunion. Who knew that polished nickel would be way less common than brushed or satin nickel? Not to mention pricey! I didn’t when I was so attracted to the ‘bling’ of the polished nickel so many months ago when I got to select the finish for my gift. So there is a mixture of finish types –most will be brushed nickel. Light fixtures, square vessel sinks and faucets purchased on ebay. Saving the existing cabinets, painting them inside and out, adding new crystal glass knobs (found on ebay and hoping the screws fit), adding toe valances we’ll make ourselves, and adding crown molding. The mirrors over the sinks are basic wood framed plain mirrors that we will paint and add moldings to. The countertop is a wood work bench top from Home Depot that we will finish with marine varnish. We already have the round mirror that is over the vanity (used to be over the fireplace in our old house). The fabric for the curtain and vanity stool cover I will sew from fabric I already have. The white beadboard wainscot and moldings are also inexpensive and to be purchased from our friends at Home Depot. 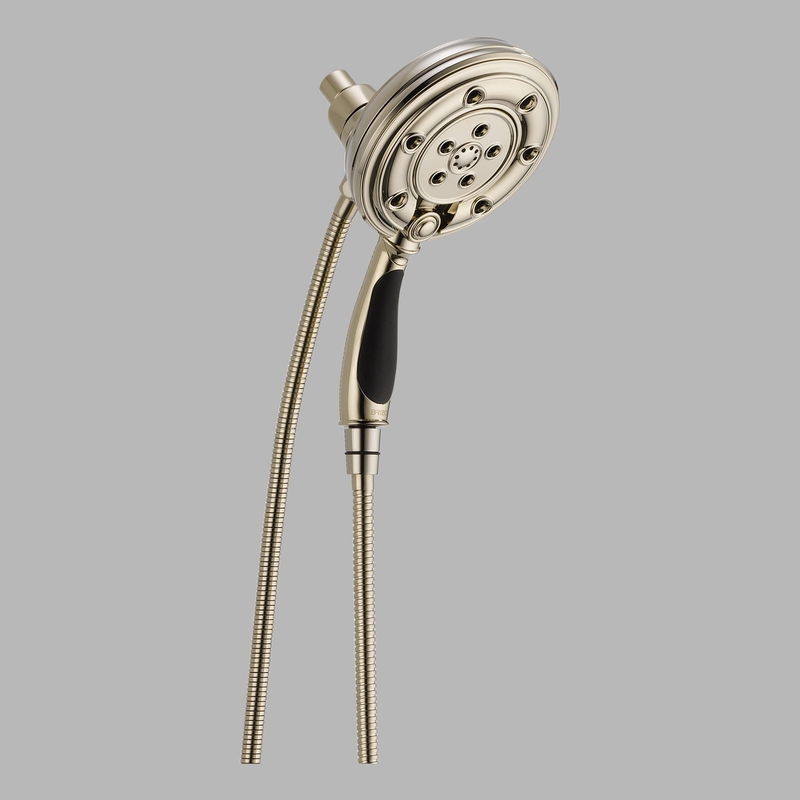 The Brizo hand-held shower head was a gift and the toilet is a Delta that was purchased months ago from (you guessed it) The Home Depot. 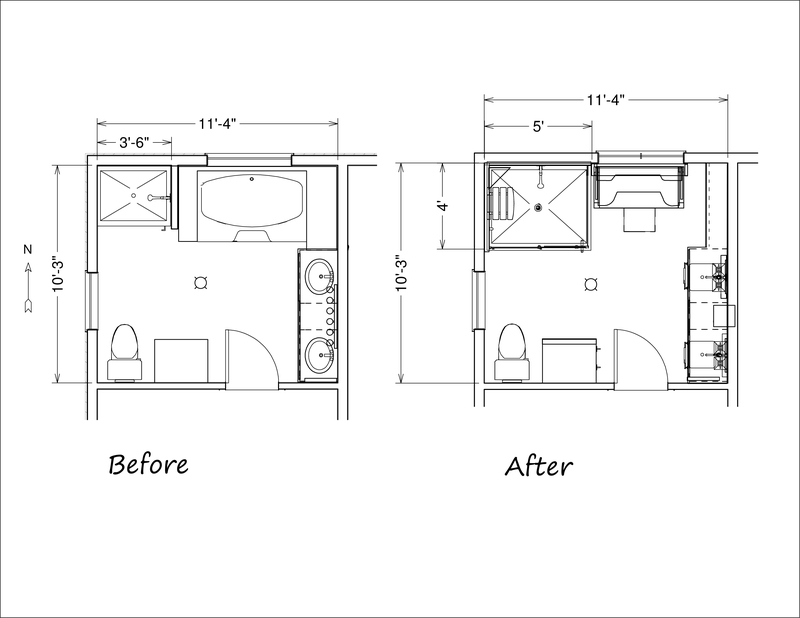 I should add that vessel sinks in the master bath would not normally be my first choice, but we are keeping the existing vanity that is only 31″ tall including the counter top. So adding the vessel sink (shown above) should put the top right at 36″. The overall cost of the remodel is expected to be about $6,000 plus any labor that we hire out (like the electrical and plumbing). When I first started this design process, my budget was looking closer to $14,000 plus labor –so I am pretty pleased with the savings and I don’t feel that I’ve sacrificed anything in terms of design. Perhaps one could argue the loss of a tub would ding the resale value. However, there is plenty of room to add up to a six-foot freestanding tub in place of the dressing table if the need arose. Considering our community is restricted to 55+ residents, I’m banking most would appreciate an accessible large shower more than a flimsy mobile home “garden” tub and closet of a shower. Since I’m now retired, I expect this is a decision my heirs will have to make! =) How long this project will take is anyone’s guess since my husband will only be available to do this on weekends. I’m expecting months. Glad we have another bathroom!